Those who know me know that Peter and Spider-Man have been a huge part of my life going back close to 25 years. I loved the Raimi movies(not the 3rd), the first Amazing Spider-Man and Tom Holland’s first appearance in Captain America: Civil War so much that I teared up multiple times. So, I’ve really been looking forward to writing this review. With all that said, let’s dive into what Marvel Studios has to offer in the latest chapter of the MCU, Spider-Man: Homecoming. I can’t start this sentence any other way: Tom Holland IS Peter Parker. Holland's performance in this film captured everything that I picture Peter being --both in and out of the suit. Spider-Man is always trying to prove himself and he certainly did that in two very big ways. On a class trip to Washington, D.C. he saves his classmates from a falling elevator in the Washington Monument and then later in the film while taking on Vulture himself in the middle of a plane hijacking. He showed shyness when he asks out Liz to Homecoming -- Peter didn’t know how to close out the conversation so he just said “I’m going to walk this way." Peter showed genuine excitement when finding out everything his suit can do each time he put it on and that's an aspect that we haven't seen until now. Then there's the moment I think he truly became Spider-Man. A warehouse roof collapses on Peter and he's crying for help, scared for his life. I couldn't help but feel every second of that. He wills himself by saying, “Come on, Peter” over and over again. Nothing. He’s still trapped. All he does is change one word. “Come on, Spider-Man” and he pulls himself from under the crumbled concrete. 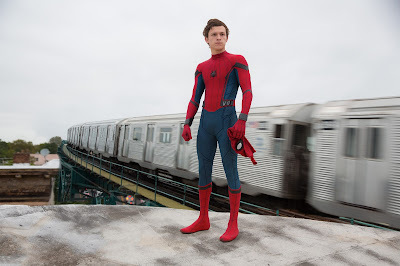 After listening to a recent interview with Tom Holland on The Nerdist podcast, this role of Peter and Spider-Man couldn’t be in more capable hands. When Keaton was cast, It was already assumed that he would give a good performance so I was not worried at all if he would be a good Adrian Toomes/Vulture. What I wasn’t expecting was how convincing he was that he truly was the hero of his own story. He runs a salvage company that cleans up all the alien destruction around the world (mainly the Battle of New York from The Avengers but there’s also some pieces that can be seen from the London Battle in Thor: The Dark World) but Damage Control, which is a pretty deep cut in the comics, takes over. And who else would own it but Tony Stark. So, Toomes has more of a reason to hate him. One of the twists/surprises in this film came when Peter goes to pick up Liz for the dance and who answers the door? Adrian Toomes. Turns out, he’s the father of Liz. While I was surprised at that, there were rumors that one of his classmates was related to Toomes but I never read who that could have been. What follows after the door opens is a pretty awkward conversation (like any father would have with a guy taking his daughter out) but things got really tense in the car ride over. Toomes started to figure out who Peter really was. The exchange between Holland and Keaton was easily the most tense moment in the entire MCU and I applaud Jon Watts for getting that tension right in the scene. The final battle between Vulture and Spider-Man is when Vulture is trying to hijack a Stark Industries plane and ends up on crashing (on Coney Island I think). As Vulture is trying to get away, Spider-Man tries to stop him because he notices some of the same explosions from the D.C. trip and he ends up saving Vulture’s life. In a mid-credit scene, Toomes is confronted by Mac Gargon in prison (he becomes Scorpion in the comics), who we saw earlier in the film, and he’s asked about who Spider-Man is. Toomes denies knowing his real identity which could lead to a future battle between the two in a later film. I’ll end with this: Toomes is the best MCU villain since Loki. All the people that Peter came in contact with never seemed out of place. Marisa Tomei’s Aunt May is that stability that Peter needs because at times, his life can get out of control balancing being Peter Parker and Spider-Man. 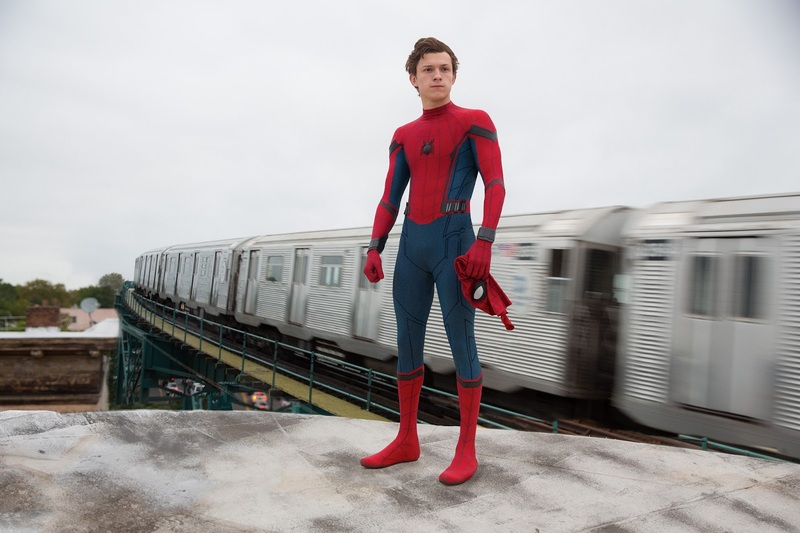 I was a little surprised that she found out that Peter is Spider-Man but that’s what Kevin Fiege, the head of Marvel Studios, set out to put on screen with this new version of the character. I’m really interested in seeing how her knowing will affect Peter going forward. Jacob Batalon really stole some scenes as Peter’s best friend, Ned Leeds and I’m glad Peter will have that “Guy in the chair” in the future. Ned, like almost any 16 year old kid, wants to tell the world that his best friend is a superhero and almost does that in a scene in Midtown High’s gym. But, Ned’s good at keeping secrets, even if he puts himself in trouble's way by covering for Peter. Flash Thompson, played by Tony Revolori, wasn’t your typical bully. He’s very mental in his bullying of Peter and you can tell by the way he dresses and carries himself, he’s that arrogant bully who has rich parents -- and we all know how those kind of spoiled kids can be. Donald Glover didn’t have as big of a role as I thought he would but he did set up something in the MCU that a lot of people are looking forward to. Glover plays Aaron Davis aka The Prowler and he mentions in a conversation with Spider-Man that he’s got a nephew living in the area. If they stay true to the comics, that means that Miles Morales is in the MCU and I really hope we get to see both Spider-Men in this amazing world. 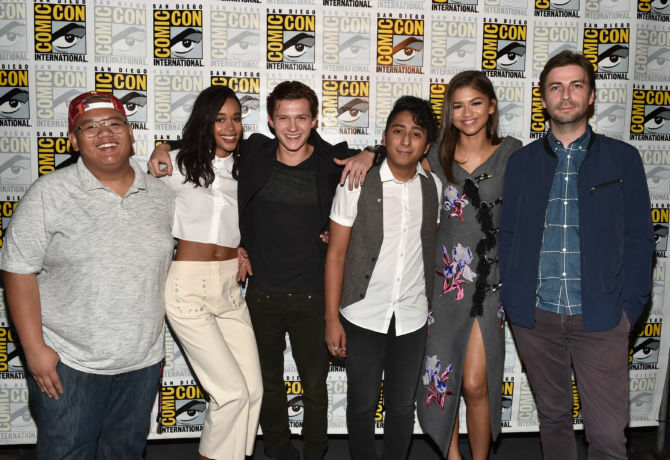 Zendaya's role of Michelle was a mystery leading up to the film because there were so many conflicting reports of who she was but she revealed in the film that her friends called her “MJ”. If they go down the road of a relationship with her and Peter, great. If not, that works too. I was hoping Mary Jane wouldn’t be seen in this film because I feel like her and Peter’s best stories are later on in high school and into college but I thought she was funny and really did a great job. I’m glad they didn’t do the typical high school movie thing of turn her into a beauty queen at the end, ala “She’s All That” but I’m excited for what she can bring to the franchise. There was an additional character that wasn’t advertised in the cast list but they are definitely a major part of the MCU and that is Pepper Potts. Yes, she makes an appearance when Tony brings Peter to the Avengers facility for a surprise. Tony was so pleased with how Peter handled himself in that last fight, probably from reports through Happy Hogan, that he unveils a new suit for Peter and it looks to be the iconic Iron Spider suit. Peter is obviously surprised at the new duds and then on top of that, Tony offers him a spot in the Avengers. Peter turns him down, much like in the books, and Tony jokes that there are reporters in the other room waiting for announcement, which there are. Pepper walks through a door, much to everyone's surprise, and turns out that her and Tony are back together and Happy has even been carrying around an engagement ring since 2008. This is going to be a little short. Like many effects heavy movies, some of the CG was a little off. Not horrible like a Syfy channel movie but maybe they didn’t have enough time to perfect it so I won’t kill it for that. Having two people play “The Shocker” was a little annoying because it wasn't necessary to have two people in that role. Toomes has an argument with Logan Marshall Green and ends up vaporizing him by accident so he tell’s Bokeem Woodbine that he’s the new Shocker now. I’m still going back and forth on Michael Giacchino's score so the jury is still out in that aspect. I think seeing Peter and Spider-Man in Captain America: Civil War was the perfect way to introduce him but I can’t say that my excitement exceeded that when I went into Homecoming. I think it’s a really great movie and I love seeing these little corners of the MCU. On a personal note, I’m really happy and proud to see my favorite character's stand alone movie being shot in my hometown of Atlanta. Tom Holland is the best overall Peter and Spider-Man we’ve got and as of right now, I’ve got Homecoming neck and neck with Spider-Man 2. I’ll have to see it one or 6 more times to see if it exceeds the Raimi sequel. I can’t wait to see what the sequel will bring us with my - and I hope your - favorite web-slinger.